Okay, when I saw this, I really wanted it. I'll admit it! I love eating...if you haven't noticed but who doesn't? I was extremely excited for August Kitchen's new sauces, J-Burger Seasoning. They come in two flavors: Chipotle and Onion and Original Onion. This stuff is awesome! I had a craving for taco salad and I thought, this would be the perfect stuff to use for seasoning. Otherwise, its usually a lot of work mixing everything in. With J-Burger, we just scooped in the tablespoons needed, mixed it all up and then cooked it. So much faster and it was so yummy! Our dog was begging at our feet throughout dinner, so we felt bad and mixed of our Chipotle and Onion flavored minced beef into her dry food and she finished her whole bowl of food. Normally, she only eats about half of it at a time. It was craziness! The cool thing about J-Burger's seasoning sauce is that you don't have to use it just on hamburgers or minced meat. You can use it as a marinade, dipping sauce or even burger topping. They have a ton of recipes available on their site. This is some good stuff. We actually cooked so much meat at once (one of those family packs) that we used up half a container of sauce. Sadly, I have to say because I really like this stuff and was a little sad to run out so quickly. 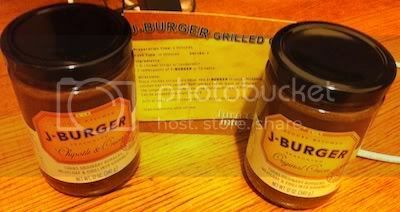 Buy It: J-Burger Seasoning 2-pack retails for $13.49. Buy from Foodzie.com and get free shipping. Win It: August Kitchen has been generous enough to offer 1 Whirlwind of Surprises' reader 1 2-pack of J-Burger Seasoning. Come enter the giveaway soon. Make it easier on yourself by showing the sponsor some love now: Like J-Burger Seasoning on facebook. Disclaimer: The product/s mentioned above have been provided by August Kitchen for the purposes of this review. No other form of compensation was received. Opinions expressed belong to Whirlwind of Surprises and are NOT influenced in any way. Please view my full disclosure. The Chipotle and Onion seasoning looks amazing. My mouth is watering now. Chipotle and Onion sounds yummy! I'm glad that it could be used as a marinade though bet you it would be good on a grilled steak. I am known at work for being the girl who always brings seasonings to use on her lunch of the day. These would be a great addition to my collection. I would love to try this! My husband and I need to have a hamburger night! Looks yummy!!!!! Can always use a good addition to the spice cabinet! Going to have to look for this. I am always looking for new seasoning options.